Condense and summarize housing codes for public consumption where possible. Institute a tracking system for code complaints, preferably an online public system such as Elgin has. Prioritize code violations in order of severity. As a person who understands that our code enforcement division is understaffed — and as someone who has occasionally nearly fallen off or through rotting front stairs and porches in this town — I totally support the idea of prioritizing dangerous states of disrepair over, say, stands of too-tall weeds. 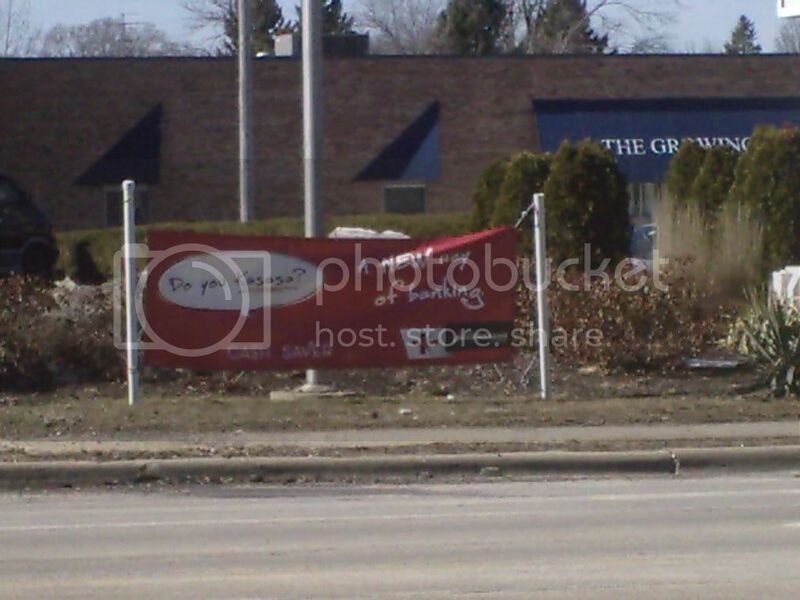 Here’s a possible place to start: DeKalb’s sign regulations. Article 13 of the Unified Development Ordinance (UDO) contains 19 pages of regulations on signage. The regs were rewritten in 2007 and updated last August. At that time, a three-month “amnesty” was put into place to give organizations the opportunity to get rid of illegal signage because the fines are pretty steep at $250-$500 per incident. Nothing much has happened. Sign violations abound, but no fines were issued during the period of my inquiry, November 1 through March 10. Also, I was told that warnings about sign violations are given verbally. From my own observations, the most problematic from an enforcement standpoint have been the rules on temporary signs, which in DeKalb means 14 days’ display for a promotion and 90 days to advertise a move. Each of the banners below has been left up well beyond the limits. Each business or other organization in DeKalb may display up to six temporary signs per year. Each temporary sign may be displayed up to 14 days. It requires an application for a permit, which costs no more than $10. Another section of Article 13, Business Signs – Wall Signs, makes clear that vinyl banners are considered temporary signs. Yet even downtown, North Central Cyclery announces its business on the side of its building with a grommeted sign, and Urban Tanks often seems to be swathed in vinyl banners. 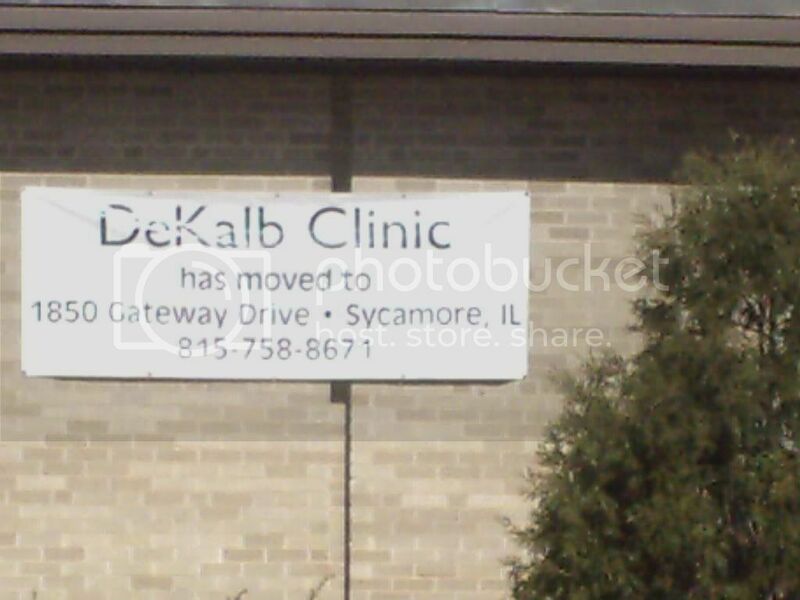 DeKalb Clinic is probably breaking two sign rules: the one about temporary signage, and another provision that says a business that has moved may display a sign announcing the new address for 90 days. Bockman’s “We’ve Moved” sign has also been up too long. Abandoned signs are signs advertising businesses that have closed or moved. They are on the City’s list of prohibited signs, so they must be taken down immediately upon closure. A few weeks ago, I noticed the sign for the Ski & Golf shop on South First was still up, and right now I’m wondering how many it will take for the Power Barn sign on Hillcrest to come down. Meineke’s, of course, is still there on Sycamore Road. The sign regulations are not like the nuisance ordinances. Because of the permitting process, it’s not appropriate just to wait until somebody complains. Perhaps having the new Public Works director on board will help free up someone to ride around, take some notes, and send letters of warning to violators. It would be a good start to enforcement on a level playing field, and to documentation of enforcement efforts. Lack of enforcement, like selective enforcement, is a bad precedent to set. Members of the city administration have been warning us that budget problems would lead to fewer services. Is the sign problem signaling a front in the struggle to provide them? If so, let’s deal with the problem head on.